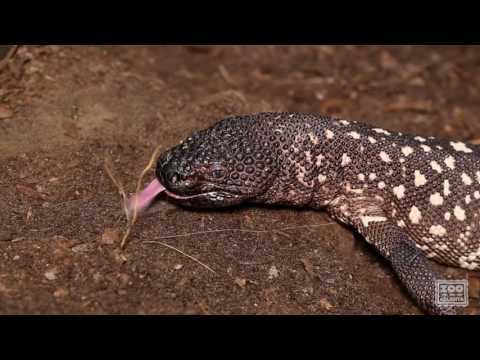 The Guatemalan beaded lizard lives only in an isolated pocket of desert in eastern Guatemala. Discovered by scientists in the mid-1980s, this distinctive lizard has been well known to local populations in Guatemala for millennia. This species is one of the five closely related species of venomous beaded lizards, including the Gila monster of the southwestern U.S. The venom is used entirely for self-defense and is not used in the capturing of prey. These lizards may be seen in the indoor gallery section of the main building of Scaly Slimy Spectacular at any time of the day or year. Beaded lizards get their name from the distinctive beaded appearance of their skin. Each scale, except for those on the belly, contains a tiny circular piece of bone calls an osteoderm. The scientific name Heloderma is Latin for “studded skin” in reference to this feature. The name charlesbogerti indicates that the species was named in honor of 20th century herpetologist Dr. Charles Bogert, who made many of the first studies on the biology of beaded lizards. Unlike venomous snakes, where venom is delivered via fang-shaped teeth on the upper jaw, beaded lizards have a few slightly enlarged teeth on the lower jaws that have venom-delivery grooves on their outer surfaces. During defensive bites, specialized glands along the lower jaw secrete a pain-inducing venom that is drawn upward along the grooves in the teeth and into the wound of the would-be predator. The stout tail is used as a brace by males during their extended bouts of male–male combat, and otherwise is used by both males and females as a site for fat storage. Fat is accumulated during the short period of the year (spring season) when food is abundant; then the fat is used to maintain the lizard through the rest of year when virtually no food is available. Beaded lizards spend a majority of their time inactive and hidden in rocky burrows or crevices. They are slow-moving and do not have the speed and agility to pursue fast-moving prey. Instead, during spring, when birds, lizards and mammals are laying eggs or producing young, beaded lizards leave their burrows and search for buried nests of eggs or nestling birds or young mammals. When they can smell that a nest is near, they may dig for hours to find a buried clutch of eggs. Beaded lizards have many remarkable adaptations for managing this contrasting lifestyle. Unlike most lizard species, they have a high aerobic capacity, and they are also able to stabilize their blood-sugar levels during intense periods of gorging and prolonged periods of fasting. The secret is a unique hormone that was only recently discovered. Pharmaceutical companies discovered and tested this particular hormone (exendin-4) and realized that it works similarly to a human hormone that regulates insulin production, except that the lizard hormone is much longer-acting. This discovery suggested great promise for medical application for humans suffering from Type-2 diabetes, and major pharmaceutical companies have since been able to produce the hormone synthetically for treatment of human diabetes. During the breeding season, males roam in search of females, which they track using their keen sense of smell. Competing males will launch prolonged bouts of wrestling over breeding rights to females. Their high aerobic capacity comes into play to allow these long and exhausting physical demonstrations. The winner is the lizard who outlasts his competitor. Depending upon the size of their fat reserves in the tail, female beaded lizards will breed every year, two years, or over longer periods if necessary. They dig a deep burrow and deposit eggs in early fall, and the young hatch about 250 days later. Beaded lizards are long-lived, with individuals reaching 50 to 60 years of age; the adults at Zoo Atlanta can be estimated to be more than 40 years old. This species occurs in only in the dry areas of the upper Motagua Valley of eastern Guatemala. The desert habitat in this region is isolated, being surrounded by massive mountains covered in humid forests where this species cannot live. Guatemalan beaded lizards inhabit a desert region that experiences a short, but intense, rainy season, followed by a very long and hot season. The local vegetation includes many species of scrubby trees and shrubs and cacti. Drained by the Motagua River, the Motagua Valley is dry because of the rain shadow effect of the massive mountain range, the Sierra de las Minas, forming the northern side of the valley. These mountains block the humid air flowing in from the Gulf of Mexico and those winds drop most of their moisture onto the steep northern side of the mountain range. Guatemalan beaded lizards live only in the desert habitat of the upper valley, and do not occur in the wetter lower valley. In the wild, Guatemalan beaded lizards feed for only a few weeks during the early rainy season, when eggs and nestling animals are available; they do not feed at all for most of the year. Because they are so well adapted to these boom-and-bust cycles of food availability, a steady diet through the year can lead to obesity. To avoid this, the Guatemalan beaded lizards at Zoo Atlanta are fed throughout the summer season and are then fed very little in winter, including a few weeks during which they receive no food. Guatemalan beaded lizards pose no threat to humans, but the fact that they are venomous has led to many myths and rumors about the species, which also commands a high value on the black-market pet trade. Concerted efforts in public outreach across the Motagua region have been effective, and recent surveys estimate that fear-based killings and poaching have been greatly reduced. Additionally, large sections of habitat are now privately owned and protected to safeguard the lizards and other wildlife of the region. Zoo Atlanta has played a leading role in the survival of the Guatemalan beaded lizard. Working closely with the Foundation for the Conservation of Endangered Species of Guatemala, we have contributed to land purchases, establishing of a field station, and funding of monitoring and surveys. Zoo Atlanta additionally houses the only breeding group of the lizards outside of Guatemala. In 2001, Dr. Jonathan A. Campbell of the University of Texas at Arlington, the scientist who originally discovered and named the species, donated the original specimens he used to describe the species to Zoo Atlanta. Although beaded lizard species are generally simple to breed in zoological settings, the Guatemalan beaded lizard turned out to be an unexpected challenge. Zoo Atlanta’s Herpetology Department has worked for years to discover the reproductive secrets of this species, and we have since celebrated a number of successful hatchings.